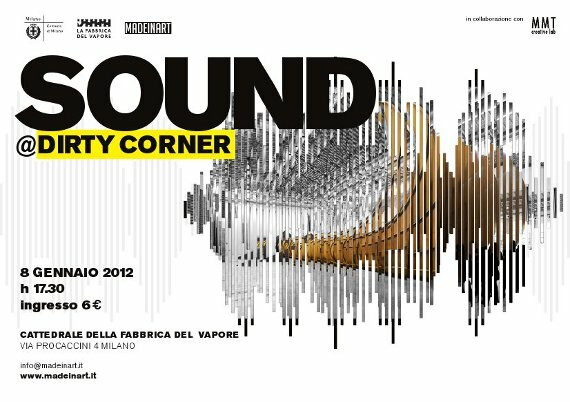 On Sunday 8 January, from the Anish Kapoor show in the Fabbrica del Vapore, Milan, acted as host to Sound @Dirty Corner, a musical event organized by MADEINART and MMT Creative Lab. Trumpets, sax, clarinets, violins, violas, cellos, percussion, and voices inhabited and questioned the acoustic spaces inside and outside the enormous steel structure of Kapoor’s 60-metres-long site-specific work. The instruments that played outside the work were heard in the dark interior of the tunnel; the voices that accompanied the walk through Dirty Corner, together with other sounds, could be heard outside: a sensory experience created by Paolo Botti, Antonello Cassinotti, Angelo Contini, Massimo Falascone, Mario Garuti, Giancarlo Locatelli, Fabio Martini, Gianni Mimmo, Matteo Pennese, Walter Prati, and Danilo Sala. The project took its cue from the idea that in Dirty Corner the artist alluded to a formal archetypal universe. The work’s void interacted with the materials it was made from; the light contrasted with the darkness inside, and the silence was interrupted by spasmodically emitted sounds. The musicians played briefly in different forms and different places to create sounds in movement, even in relation to the path followed by the public.